It’s a sunny pleasant evening in June. The temperature stayed in the low 70s today. Tomorrow evening we will be putting in hay. It has been a good week for haymaking. Last night our family attended the eighth-grade graduation for the class of 2017. Son Joseph was among the twenty students who graduated. Sixteen boys and four girls were in the class. Four of the boys and girls were Amish students, so this will be the last of their school education. The rest of the students will go on to high school. It always tears at my heartstrings when another one of our eight children has their final day of school. Two out of the eight are still in school, with Lovina headed for seventh grade and Kevin for sixth grade. At the graduation, little nine-month-old Abigail enjoyed clapping with the crowd. And of course she liked to chatter while everyone else was quiet! Daughter Elizabeth and Abigail were here today. Abigail gives kisses now, and we have just so much fun with her. Last week niece Rosa and Menno had a nice wedding day. On the menu were: mashed potatoes, gravy, chicken and noodles, dressing, mixed vegetables, broasted chicken, lettuce salad, carrot salad, sliced American and Colby cheese, homemade bread, butter, strawberry jam, cake, cookies, bars, frozen mocha dessert, mixed fresh fruit, cherry, pecan and chocolate peanut butter pies, and wedding nothings. The broasted chicken was made by brother-in-law Levi’s cousins. We had our driver pick-up time set for 5:00 a.m. and were back home around 1:00 a.m. It was a long day, but we enjoyed it. Sisters Verena, Emma and I and a local lady from their church were the head cooks, so we had to keep everyone busy with their assigned jobs. It seemed like everything fell into place really well. Many hands make light work. Sisters Verena and Susan went out there on Thursday morning with sister Emma and I. We helped with all the work that goes with preparing for a wedding crowd of people: “nothings” were made, seventy-five pies were baked, and vegetables were diced for dressing and salad. Sisters Verena and Susan stayed until Sunday evening to help sister Liz clean up from the wedding. Friday is a half day of school and the last day for this term. We plan to attend the school picnic on Friday. Our youth are invited to the wedding of Richard and Hannah on Thursday evening and to the wedding of Robert and Eva on Friday night. There is also a funeral Friday. It is one of son-in-law Timothy’s aunts. Our sympathy goes to the family. Thirteen years ago, when we moved to this community, I don’t think two weddings and a funeral in two days would have been possible. Our community here has grown so much in the last few years! This is now the following morning. It’s another beautiful day, and it’s laundry day for Loretta and me. My husband Joe, son Benjamin and daughter Verena are at their jobs. The three youngest have left for the last day of school. Last night I finally stepped foot in our garden for the first time this year. Son-in-law Mose was tilling the garden while husband Joe and son Joseph helped me lay weed-control landscape fabric where we planted our cucumbers and watermelon. I always like to use that where my viney plants are, because it keeps the weeds down around them. We are enjoying radishes, green onions and garden lettuce. The girls made macaroni casserole. It’s a new recipe I wanted to try, as I wrote it down for niece Rosa’s recipe shower. It was a hit in this family! It says it serves eight to ten people, but I would say twelve to fourteen. Our casserole mixture filled a 9 x 13-inch pan plus a two-quart baking dish. To those of you with small families, I would suggest cutting the recipe in half. Lovina’s daughters made a new macaroni casserole that the whole family enjoyed. We enjoyed meeting readers at the Blue Gate Restaurant and Bakery in Shipshewana, Ind., on Saturday, June 3. We also met some more people who never read the column but were interested to find out where they can read it. After six Saturdays of book signings, I am looking forward to this Saturday at home! 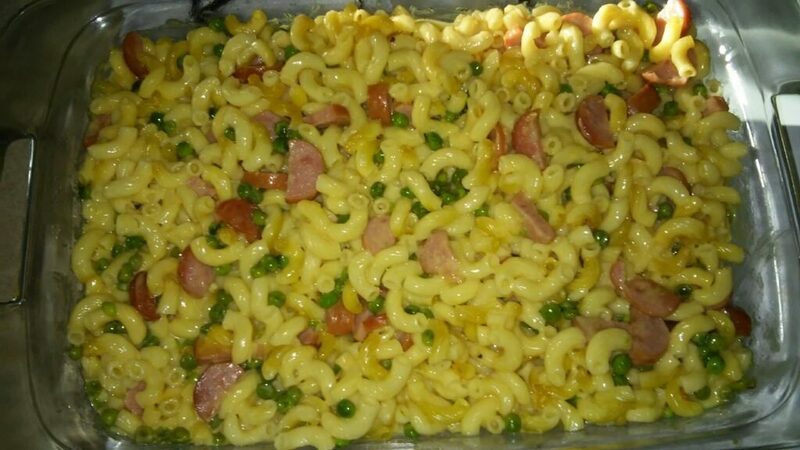 Cook macaroni according to package instructions and drain; add peas and meat. In another pot, simmer cheese, milk, soup and salt until cheese is melted. Add to macaroni mixture and place in greased baking dish. Bake at 300 degrees for one hour. Serves 8–10. all the recipes. Having been a reader of Lovina’s column for many years, I have a folder full of newspaper recipes. I especially love the rhubarb recipes. What are wedding nothing’s? Love your column….. I am so happy to have stumbled across this column!! I used to read when Elizabeth Coblenz wrote it and when Lovina took over. When the author for the old column was changed by the editor, I stopped reading. I am so happy to find you are all doing well and now have a grandbaby. I now have a great granddaughter to love on. God’s continued blessing on your family!! My family and I have gone to many Amish dinners w/friends that have been served in an Amish home. At each meal, one of the drinks offered is a “spearmint tea”…. It is just delicious and liked by all. Could you please share the recipe w/me? I am near to Shipshewanna, In. Do one of the stores care it or is it homemade? Thank you…. P.S. Love Love Love ‘The Amish Cook” column in our paper every Monday.